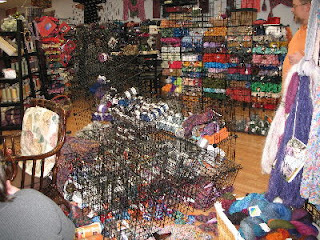 Amy, Carla & I had so much fun at Threadbear this past weekend that the walls fell down. I had an amazing group of women for my Knit to Fit class on Saturday. There was much giggling and groping of boobies, bellies and butts. Our hosts with the most. We were lucky enough to get to stay chez Rob & Matt. We were all quite silly and laughed ourselves literally to tears, over things that are unprintable. Also thanks to the boys I am now addicted to The Soup & Project Runway. 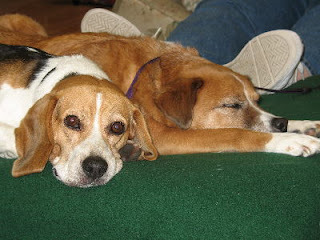 We even wore out the dogs with our shenanigans. Now I have the laryngitis that my children so nicely passed on to me. 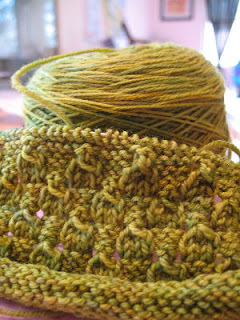 I'm healing myself by knitting lace swatches of the Dream in Color (Spring Tickle) sock yarn I bought. I want to make a sweater, yes on size US2 - it just has to be done before I die. I was one of your insubordinate students...your class was great fun! You turned me back onto the possibility of sweaters. I'd sworn off after every one I knit didn't fit. Whereas, my socks always fit and don't make me feel fat! Maybe thick in the calves, but not fat! Thanks Amy!!! 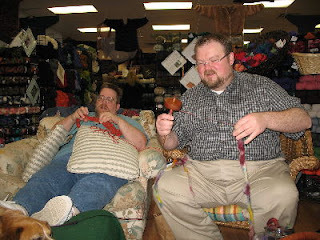 I love that yarn -- I don't think I'd get tired of it, even 100,000 stitches in. Well, yes, I would, but it'll be great when it's done, and the result will be so wearable and beautiful as a result. And I'm jealous that you got to hang out with Amy and the fellas.